Most drivers in the Chicago area know that Honda vehicles are reliable, and that they’re often recommended over less-dependable competitors. Still, unless you’ve done your research, you may not realize where the Honda CPO program offers real advantages over competing programs from their rivals. In fact, in many ways, the Ford CPO program is similar to that offered by Honda. Both manufacturers incentivize drivers to choose their used vehicles by offering extensive vehicle inspections, warranty coverage, as well as additional benefits worth exploring. However, only the Honda CPO Program offers drivers more of what they want. In order to be eligible for the Ford Certified Pre-Owned Program, a vehicle must be fewer than six years old, with less than 80,000 miles. A CPO Honda must also be fewer than six years old at the time of its recertification, and also reflects the 80,000 miles limit. Qualifying vehicles are then given thorough inspections. A CPO Ford has to make it through a 172-point inspection, while a CPO Honda must pass an even more comprehensive 182-point inspection. If your vehicle is still under its initial New Car Limited Warranty at the time of your purchase: up to 4-years/48,000-Miles of non-Powertrain Warranty Coverage. Test Drive a CPO Honda at Muller Honda Pre-Owned! Now that you’ve seen how the Ford CPO program measures up against the more extensive Honda CPO vehicle coverage, it’s time to take the next steps. 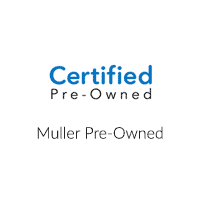 Compare the Honda CPO protections to those offered with a CPO Toyota, and once you’ve seen enough, start exploring the certified pre-owned lineup at Muller Honda Pre-Owned. A CPO Honda comes standard with exceptional protections, and when you drive with us, you’ll also benefit from our trained technicians, genuine OEM parts, and speedy service center. Contact us today to learn more about your options.